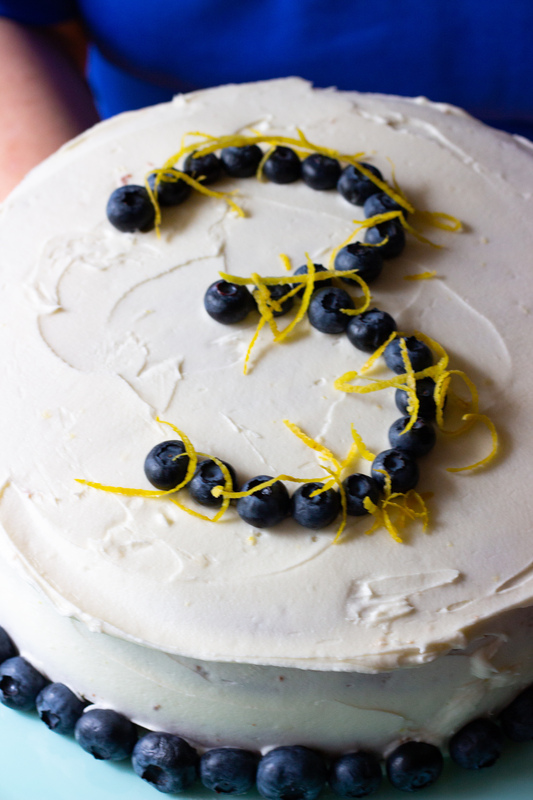 This cake was my third anniversary cake… and it was everything that I wanted in a summertime cake. It was light, slightly sweet, and a little bit tart – basically it was all my favorite things combined into one delicious package. I can’t take full credit for the full recipe for this cake. The cake is adapted from the Williams-Sonoma Cakes, Cupcakes, and Cheesecakes cookbook my friend P got me for my 18th birthday. 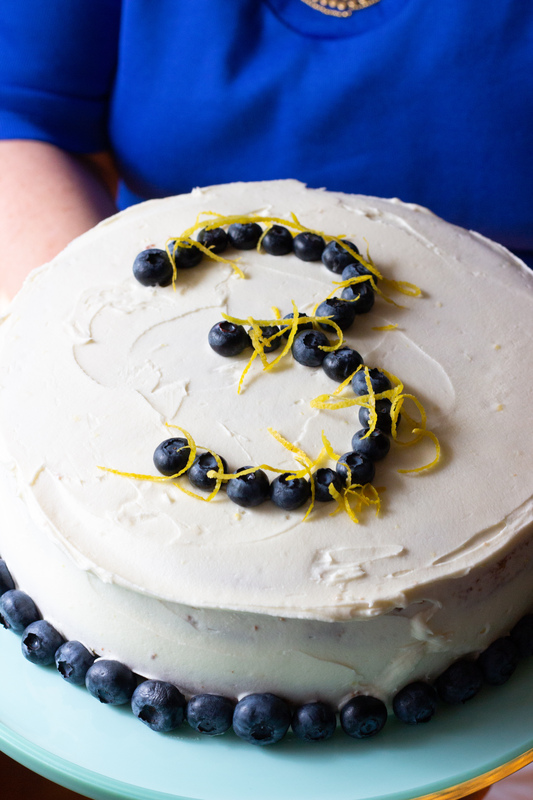 Little did she know that it would become my go-to cake for summer entertaining. It is traditionally made in a bundt pan and drizzled with a quick powdered sugar glaze. It’s quick to pull together but the look is so impressive. To make it a celebration cake, I baked the cake in two cake tins and stacked them with a lemon-vanilla buttercream. It was dreamy, yummy, and a breeze to make! It starts with making the cake layers. In a large bowl, combine flour, baking powder, and salt. Stir to combine and set aside. In the bowl of a stand mixer, combine butter and granulated sugar and beat until light and fluffy. Add in some eggs, some vanilla extract, some greek yogurt (if I’m out of plain, I add in a blueberry flavored one! ), and the zest from half a lemon. Beat the wet ingredients until combined. Then add in the dry ingredients alternated with some skim milk, starting and ending with the dry ingredients. Then take the bowl off the mixer, scrape the sides and bottom to make sure all the flour is incorporated. And then add in the star of the show – some beautiful blueberries! I like to stir them in by hand to prevent any squashing. Pour the batter evenly into two greased and parchment paper-lined cake tins (mine are 9-inch pans). Using a spatula, make sure that the cakes are even on the top. Bake the cakes for 30-40 minutes, or until a toothpick inserted into the middle come out clean. Allow the cakes to cool in the tins for about 10 minutes and then invert them onto racks to cool completely before assembling the cake. While the cakes are cool, whip up the buttercream icing. I am obsessed with Deb Perelman of Smitten Kitchen and I lightly adapted her vanilla buttercream recipe for this cake. What I loved is that you can make it in the FOOD PROCESSOR. Basically you dump everything into the food processor and buzz everything until light and fluffy. I added a healthy dose of lemon zest to the frost to give it a light and lemony flavor. I added blueberries and lemon zest as accents, but it tastes just as yummy plain and unadorned. Everything is perfectly sweet, slightly tart, and everything summer. ¼ cup plain Greek yogurt - in a pinch, you can use a blueberry-flavored yogurt! Preheat your oven to 350 degrees. Spray two 9-inch round cake tins with cooking spray and line the bottoms with parchment paper. Set aside. In the bowl of a stand mixer, combine butter and granulated sugar and beat until light and fluffy. Add in some eggs, some vanilla extract, some greek yogurt (if I'm out of plain, I add in a blueberry flavored one! ), and the zest from half a lemon. Beat the wet ingredients until combined. Then take the bowl off the mixer, scrape the sides and bottom to make sure all the flour is incorporated. And then add in the star of the show - some beautiful blueberries! I like to stir them in by hand to prevent any squashing. Pour the batter evenly into two greased and parchment paper-lined cake tins (mine are 9-inch pans). Using a spatula, make sure that the cakes are even on the top. In the bowl of the food processor, add in all of the frosting ingredients. Blend all the ingredients together, beating until frosting is light and fluffy (about 2-3 minutes. Place one cake layer on a cake plate. Add a third of the frosting onto the layer and spread into an even layer. Top the frosting with the second cake layer. Add another third of the frosting to the top of the cake, spreading it into an even layer, allowing some of the frosting to fall down the sides. Using the frosting falling down from the top and the remaining frosting, frost the remaining sides of the cake. 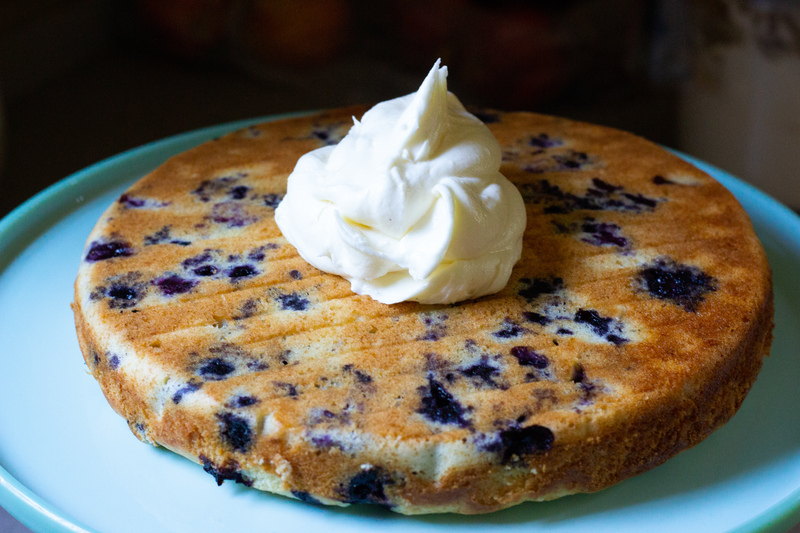 Decorate with blueberries and lemon zest before digging in! Recipe for cake is lightly adapted from Williams-Sonoma Cakes, Cupcakes, and Cheesecakes cookbook. Recipe for frosting is lightly adapted from Smitten Kitchen: Every Day by Deb Perelman.